Note that all characters in this article are meaning-sound compounds. Such compounds are created by one part carrying information about meaning and another about sound. Read more here if you’re not sure how this works. This character is a left-right composition consisting of 余 (yú), which is the pronoun “I” in classical Chinese and here gives the character its sound. The second component is originally ⺙ (pū), which means “strike”, but in simplified Chinese, this has been replaced by 又 (yòu), which is a pictograph of a hand and means “also” in modern Chinese. My guess is that this character is hard because most students haven’t learnt 余 properly and might confuse it with visually similar characters, such as 金, 全 and 于. Another possibility is mixing it up with 徐 or 序, which are pronounced xú and xù respectively (thanks to Simon for pointing this out). My personal mnemonic for this character is a very old me (余) striking (⺙) my glass to call attention to my guests so I can tell them about old times. This is also a left-right compound. The left part, 豙, is extremely rare, so it’s perhaps butter remembered as a combination of 豕 (pig) and 立 (to stand). This is the sound component (豙 is pronounced “yì” and 立 is pronounced “lì”). The right part is 殳, which is a halberd-like weapon. There is no simplified/traditional difference here. There is only one really common word for this character and that’s 毅力 (yìlì) “perseverance; will power”. We also have the less common 毅然 (yìrán) “resolutely”. This character was very hard to learn for me before I learnt the components properly. None of the components are really used as individual characters, so if you don’t study them specifically, you won’t know them. However, they are quite common as components, so learning them makes sense. My mnemonic for this character is a boy standing (立) on the back of a hog (豕) swinging a halberd (殳), participating in some kind of contest to see who can persevere the longest. The left part of this character is 扌 “hand”, which should be one of the first components you learn because it’s so common. It’s related to the meaning of the character. 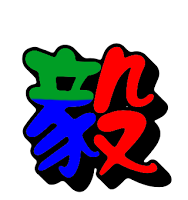 In simplified Chinese, the right part is a combination of 九 “nine” and 力 “force“. Note that the traditional version is deceptively similar, but uses 尤 instead of 九. Again, this character is probably difficult if you don’t sort out the component parts. There are many strokes that form no distinguishing features (such as boxes or other recognisable shapes). However, if you know the parts well, it isn’t that hard. Try the mnemonic “using your hands (扌) to throw something away with the force (力) of nine (九) men” (or, if you learn traditional, “with extraordinary force”). That’s it for today! Do you find these characters difficult? Have you developed better mnemonics than those I share here? Or do you have a question? Leave a comment!